Sven, the Rogue Knight, is one of the most basic core heroes in the game. With a straightforward playstyle, plenty of durability to work with, and a reliable area-of-effect stun ability, Sven is typically recommended by veterans to new Dota 2 players when it comes to learning the game for the first time. True enough, the margin for error with Sven is quite generous, thanks to his tankiness and simple approach to the hard carry role. With his first ability Storm Hammer, he can lock down multiple targets from range, stunning them for a few seconds while dealing a hefty amount of magic damage in the process. In order to close the distance, he can activate Warcry, giving him a boost in movement speed as well as armor. His only passive ability Great Cleave allows him to deal damage in a wide cone in front of him, albeit at a somewhat reduced rate. With his ultimate God’s Strength, however, he flies into a rage, vastly increasing his attack damage—which works in tandem with Great Cleave when it comes to dishing out the pain. Combined, both abilities can easily delete entire teams before they even have a chance to react. Despite his incredible power, though, Sven has several glaring weaknesses that keep him from being unstoppable. For one, he requires plenty of movement speed and mobility, being a melee hero that needs to be up close to his targets in order to kill them. Sadly, Warcry is usually not enough to make up for his lack of mobility, which means that he is quite reliant on items such as Blink Dagger and Mask of Madness. As a consequence, kiting Sven is a trivial matter, especially with items like Force Staff and Rod of Atos. Furthermore, Black King Bar is also a requirement for Sven, as he is easily locked down and/or kited without it. This essentially renders one of his inventory slots forfeit, which can mean the difference between victory and defeat in deep late game situations. To top it all off, his low base attack speed means that he will also need to supplement it with attack speed items—for his damage per second is actually pitiful otherwise. But with enough farming space and the right items, Sven can be very difficult to contain in the late game. There is just little standing in the way of a magic immune, God’s Strength-enhanced juggernaut like him, and all those who dare to get in front of him will pay dearly. Sven’s ability progression depends primarily on whether or not he is to be placed in an aggressive lane. Even then, though, the paths in his skill build diverge only at the point where Great Cleave would otherwise hit Level 3 before God’s Strength is available. For the farm-focused Sven, this would be the ideal path. 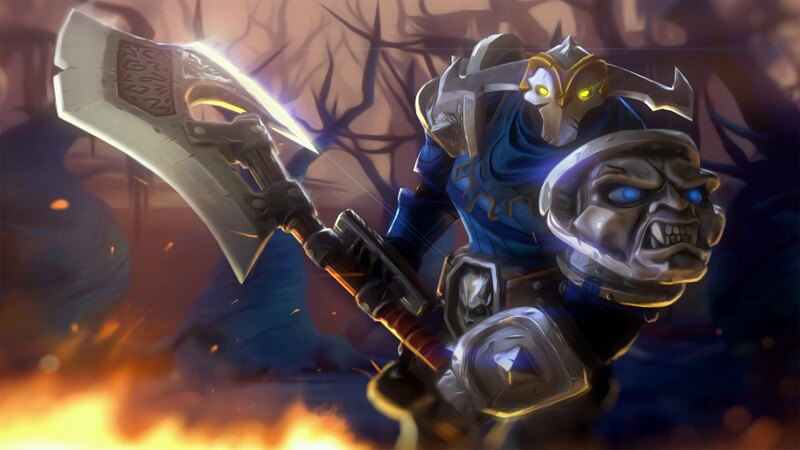 For the aggressive Sven looking to score kills in lane, however, investing early into Storm Hammer would be a lot more impactful—for obvious reasons. You will of course want to pair your stun with nukes and/or other stuns from your lane partner(s), which can help secure kills if done correctly. Remember to chain your stuns properly by waiting until the last second of each stun’s duration before applying the next one, to maximize the length at which you have your target disabled. Regardless of the path you choose to take, however, investing value points into the abilities that your chosen route does not emphasize will still be a good idea. Warcry can be used to escape early gank attempts from enemy heroes, thanks to the small boost in movement speed and armor that you get out of it. Great Cleave, meanwhile, accelerates your farming pace, especially if your supports are diligent at stacking creep camps for you. As for God’s Strength, it should always be taken at every ultimate level. Sven’s usual items are pretty much what one would expect from a hard carry’s inventory, though they do lean more towards increasing attack speed over just raw damage. After all, God’s Strength already provides the attack damage that items would otherwise—so the important thing to address is his low attack speed first. Power Treads and Mask of Madness help Sven farm in the early to mid game, with the latter also providing some handy lifesteal so that he’s always topped up while killing creep stacks. Blink Dagger should be the next priority after the first two early game items, though. Blink Dagger allows you to pre-cast God’s Strength and Warcry while approaching targets in the mid game, giving you plenty of time to blink right on top of them and stun them with Storm Hammer without wasting much time. Blink Dagger also gives Sven an escape mechanism, beyond just popping Warcry, running away and hoping for the best. The importance of the mobility that Blink Dagger gives you cannot be understated, so try your best not to skip it. We recommend closing out the mid game by buying a Black King Bar, in order to protect yourself from the powerful nukes and disables that come online at this phase of the game. Sven’s momentum can be very easily nullified if you aren’t careful, but Black King Bar gives you a valuable safety net. Don’t skip it, for the love of Omniknight. The final piece of the puzzle for Sven is his favorite damage item: Daedalus. The item is so suited for him that he even has a comedic voice line referring to it. With a bit of luck on your side, God’s Strength and Great Cleave can erase entire teams in seconds if your critical strike procs are on point. Of course, this item on its own is worthless if you don’t have the attack speed to support it, so make sure you have that squared away first. That said, there is still room for more attack speed items later on. Assault Cuirass is one of Sven’s most desired luxury items, as it reduces enemy armor while greatly increasing his passive attack speed. Consider this item if the game goes really late, in order to boost your attack speed further. Moon Shard can also be used in this regard, and can even be consumed in order to save inventory slots. The rest of his items will be composed of situational pickups, determined by the enemy lineup for the most part. Get a Silver Edge if you need to disable key passive abilities, especially those of a defensive nature like Phantom Assassin’s Blur. Monkey King Bar can be used to counter evasion as well, though. With enough attack speed in the bag, you can also opt to throw away Mask of Madness and replace it with a Satanic, if you need the sustain in teamfights. Initiating with Sven is almost laughably easy, assuming you have a Blink Dagger on hand. As mentioned above, you’ll want to pre-cast your two buffs before jumping in, so that you can spend more time wailing on your enemies than going through the cast animations. Once you’ve got your buffs up, blink in and immediately stun as many heroes as you can with Storm Hammer. Activate Mask of Madness if you have it, then go to town with your regular attack. Use the bonus movement speed from both Warcry and Mask of Madness to chase any stragglers if need be, alongside Storm Hammer when it comes off cooldown. Because Sven is easily kiteable, drafting a lineup of mostly ranged heroes or heroes with high movement speed is a good idea against him. Heroes with potent slows such as Venomancer and Viper also work well versus Sven, though of course their slows will be nullified once BKB is online. Picks like Clockwerk, Enchantress, and Sniper, who can abuse Sven’s need for good positioning and terrible range, do pretty well against him too. Sniper in particular can take pot shots as Sven all day assuming he does not get caught off guard with a Blink Dagger initiation, while Enchantress can kite him endlessly thanks to Enchant and Impetus. Should Sven dare to raise his hand against her, Untouchable will slow his attacks down immensely. Clockwerk, on the other hand, can cage Sven within his Power Cogs, preventing him from reaching his targets in the first place. Harassing Sven in the early game is also key to preventing him from getting big. His below average starting armor means that he doesn’t take hits very well in the laning phase, despite his high base health. Magic damage also helps in this regard, as it ignores his armor completely and goes straight for his HP instead.